Yup, that's our summer countdown, reaching the floor. Laugh all you want, I can take it! Tomorrow is Friday, woot woot!!!! Super cute! I will definitely have to do this next year! =) Good luck with your last few weeks! 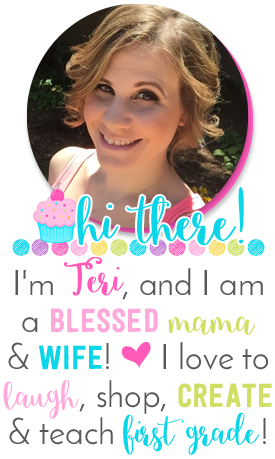 LOVE it Teri!! I use a rainbow incentive system for one of my littles that has a little behavior problem - she would die for this!! I'm thinking next year! I love the rainbow countdown!! I can't wait to do this! Your brain never stops thinking of cuteness! Have you prepared your kiddos for craftivity withdrawal??!!??? It seems like everyone is out or almost out for summer so I'm comforted by the fact that I won't be alone this next month going to school. We aren't out until June 19th! I'm catually glad though because there is so much I want to do with my class still! I love your count down ideas! Such a fun end of the year idea for students and teachers. Love how bright and colorful it is! Too cute. BTW that chain is too stinkin long if you have that many days left!! Looks like you have some great "summer" pinterest ideas to work on. I LOVE your colorful rainbow cloud. So cheery. That clipboard idea is pretty cute, too. I like all the ideas mentioned. I've always thought that doing this to early took the focus off the task at hand and kind of fed the false notion "Teachers just live for their holidays and Summer". I can see the benefit especially if you have a group of really driven kids. I'm so glad I found your blog! I am a teacher returning this year after 2 years leave to be a SAHM! My blog roll currently consists of mom blogs and craft/sewing blogs. You are my first teaching blog! YAY! I taught 5th, then 3rd for 4 years, and am now moving down to 2nd. I love your ideas! 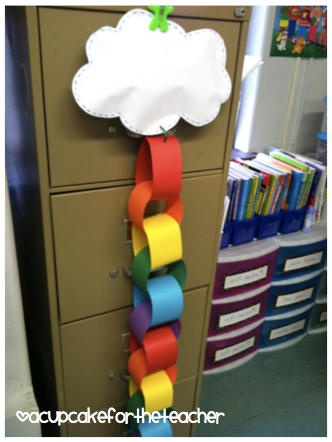 I just posted about the countdown to the end of the year rainbow chain on my blog. I made it this week for my kiddos with 16 days left. We have been cheering every day when we tear a chain off. What a super cute idea! Thanks for sharing.I am one of your newest followers. I would like to use your picture in an upcoming blog post. 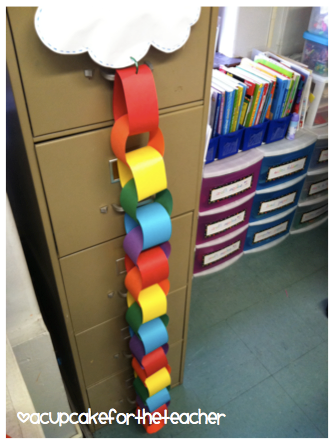 I want to adapt your rainbow chain to use it in a behavior management idea. Would you give your permission for me to use the picture? I would send a link to the post when I finish it also. I hardly ever write comments on blogs, but your article urged me to praise your blog. Thanks for the read, I will surely favorite your site and check in occasionally. Cheers. Teaching is a noble profession. Hats off to your efforts.